Are you claiming that the apostles set up the beginning of the Catholic Church in the first century? I notice the reference of calling teachers and officials of the church "bishops?" Is this word in the New Testament? When was the church officially titled The Roman Catholic Church? Great questions! Thank you for asking. I am not claiming that the Catholic Church (under a single Roman leader) started under the original apostles. I am not sure when the Catholic Church was first called the "Roman Catholic Church" and referred to a single Roman leader. What I can tell you is that this did not happen in the first four centuries which is my era of expertise. 3. Ephesians 4:11 - the dating in not clear on this letter, could be late 50's (completed after Paul's death, possibly in the 70's or 80's). Some scholars do not think Paul actually penned this letter, others think it was Pauline. 4. 1 Timothy 3 and Titus 1 - here are the only times in the NT when "bishops" are referred to. Most translations use "overseer," but some translate "bishop." The Greek word is "episcopas," which immediately makes one think of episcopal like the Episcopal Church. However we translate this word it means a man who is "over" or gives "oversight" to others in leadership. I think many of our translations stay away from words that remind us of the Catholic Church: like "bishop" and "Eucharist." Both are words found in the Greek NT, but because Protestants have such a dislike of the Roman Catholic Church our translators steer away from these kinds of words. 5. Didache - circa late 60's early 70's. Didache speaks of leadership positions - but does not specifically mention bishops. 6. 1 Clement - circa 90's, possibly during the Domitian persecution. ...they [the apostles] appointed those [ministers] already mentioned, and afterwards gave instructions, that when these should fall asleep, other approved men should succeed them in their ministry. We are of opinion, therefore, that those appointed by them, or afterwards by other eminent men, with the consent of the whole church, and who have blamelessly served the flock of Christ, in a humble, peaceable, and disinterested spirit, and have for a long time possessed the good opinion of all, cannot be justly dismissed from the ministry. This passage continues, but refers to the position as "presbyters," another Greek word used by Paul in 1 Timothy 4:14 translated by some as "elders." This reflects more of the Jewish terms used in the primitive and mainly Jewish Christians immediately after the resurrection. But either way, no matter which word is used, Clement is talking about a leadership position of a man who is to give oversight to others in leadership and serves in a lifetime appointment. Some date these letters as early as 107AD, others date them as late as 140AD. Ignatius was the bishop of Antioch, arrested by the Romans and led to Rome for trial and ultimately his execution. Along the way he dictated (or wrote) letters to several churches in which he speaks strongly what is now called "monoepiscopacy," that each city or region has one single bishop who gives leadership to all pastors, etc. in that city/region. These are just a few of the statements made by Ignatius regarding the role of the bishop. This evidence shows that the role of a leader that gives oversight to other leaders in the church started at an early date. Even for those who doubt Pauline authorship of the Pastoral epistles (Timothy and Titus), the church followed this leadership model as early as the latter 25 years of the first century. This, however, does not equal the Roman Catholic Church. The Catholic Church points to Peter as the first bishop of Rome and then traces the lineage of bishops from each major city in the early church. This is done by Irenaeus and others in their attempt to show that the catholic church was THE church, opposing the growing problem of the Gnostics who also claimed to be THE true followers of Christ. 1. Did the apostles set up the Catholic Church? 2. When did the Catholic Church take on the name "Roman?" 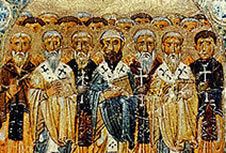 The Catholic Church and the Orthodox Church both claim that their particular movement is traced back to the apostles. As a concept, I completely agree: the Christian Church certainly can be traced back to the original apostles and the writers of the documents that became the New Testament. Having said this, if I were in a direct conversation with a Catholic or Orthodox priest and they were maintaining this argument I would simply bring up several examples of disagreement or controversy that happened during the first few centuries. Issues where both sides claimed to be speaking for God's church, the catholic church and the orthodox system. I would ask such a modern person: which side was correct? And, does your lineage trace back through such controversies and issues? What about when African bishops disagreed with the Roman bishop and refused to agree and "get in line?" There is no doubt that early Christian writers referred to "the catholic church." Notice the small "c." In almost all English translations this is how such a reference is translated. They are translating the word "katholikos" which can be translated "universal," "the whole," or "in general." There are many references in the early writers using this term, but they are not meaning what we now refer to as the Catholic Church with a capital "C."
"From this time forward the technical signification of the word Catholic meets us with increasing frequency both East and West, until by the beginning of the fourth century it seems to have almost entirely supplanted the primitive and more general meaning." But it is quite important to understand that we are NOT talking about what becomes the Roman Catholic Church later in history. Catholics and Orthodox believers alike lay claim to this early designation - both cannot be correct unless they are referring to the "universal" church that existed in the first several centuries...and in the discussions I have personally witnessed, this is NOT what they mean. There are many definitions as to what exactly is meant when we refer to "The Catholic Church." I lean towards the concept of the Roman bishop becoming formally known as the "Pope," and to his authority being accepted by ALL the other bishops. This certainly did not happen before Nicea in 325AD. There were conflicts in the second and third centuries where African and Middle Eastern bishops disagreed with, and simply did not accept the judgement of the Roman bishop. Thus, if Roman authority has anything to do with the movement being "Catholic," it had not happened by 325AD. Even the Donatist conflict in the early years of Constantine (early fourth century) show this lack of Roman power. Constantine implored the Roman bishop to handle the situation and schism in Northern Africa and a significant number of African bishops rejected his ruling. Constantine, an imperial Roman leader, tried to solve the crisis and they refused to abide by his ruling. The Donatist controversy is important in this discussion because the issue at hand was NOT theological in the first instance - really it came down to whether the African Donatist "bishops" and "pastors" would submit to the "catholic" leadership. No, in my opinion what we know as the Catholic Church did not become an entity until Gregory the Great was elected Pope in 590AD. Under Gregory's leadership it appears that all regions and bishops in the West accepted the primacy of the Pope. Many of the practices that have become known as "Catholic" were either instituted under Gregory or confirmed as the standard. I believe this happened under Emperor Theodosius in 380AD. This is outside my area of direct knowledge, thus I must admit that I am not certain of this particular fact.